The Global Volcanism Program has no activity reports for Otdelniy. The Global Volcanism Program has no Weekly Reports available for Otdelniy. The Global Volcanism Program has no Bulletin Reports available for Otdelniy. The Global Volcanism Program has no synonyms or subfeatures listed for Otdelniy. The early Holocene Otdelniy shield volcano (Masurenkov, 1980) lies east of the Savan River, across from the Pleistocene Savan volcano. It, along with adjacent shield volcanoes and a large group of late-Pleistocene to Holocene basaltic pyroclastic cones, is located about halfway between Khodutka and Opala volcanoes. Three groups of late-Pleistocene to Holocene pyroclastic cones and associated lava fields are also located along a roughly 20-km-wide area between the Opala and Savan rivers, SE, S, and SW of Opala. The Global Volcanism Program is not aware of any Holocene eruptions from Otdelniy. If this volcano has had large eruptions (VEI >= 4) prior to 10,000 years ago, information might be found on the Otdelniy page in the LaMEVE (Large Magnitude Explosive Volcanic Eruptions) database, a part of the Volcano Global Risk Identification and Analysis Project (VOGRIPA). There is no Deformation History data available for Otdelniy. There is no Emissions History data available for Otdelniy. 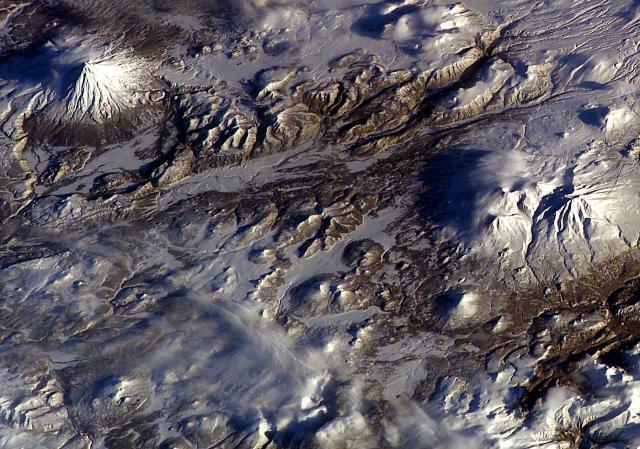 A large group of small shield volcanoes and pyroclastic cones lies at the bottom center of this NASA Space Shuttle image (with north to the top). Otdelniy, Tundroviy and other adjacent unnamed shield volcanoes are surrounded by a large group of late-Pleistocene to Holocene pyroclastic cones SE of Opala (the conical stratovolcano at the upper left) and SW of Asacha volcano (right-center). Scattered groups of young pyroclastic cones are also located south of Opala caldera, whose rim is seen at the left-center. NASA Space Shuttle image ISS006-E-36667, 2003 (http://eol.jsc.nasa.gov/). There are no samples for Otdelniy in the Smithsonian's NMNH Department of Mineral Sciences Rock and Ore collection. Large Eruptions of Otdelniy Information about large Quaternary eruptions (VEI >= 4) is cataloged in the Large Magnitude Explosive Volcanic Eruptions (LaMEVE) database of the Volcano Global Risk Identification and Analysis Project (VOGRIPA).